Slow drain lines or clogged sewer pipes can cause major problems and even be a health concern. Our Drain Cleaning equipment allows our team to pinpoint the exact location of the clog and solve the problem once and for all. Solving one clog at a time in the San Francisco, San Mateo to Daly City area. Gruber Plumbing offers Rooter service and emergency plumbing service for the San Francisco Bay area to include South San Francisco, San Mateo, Daly City & Moss Beach, CA. We have the latest tech equipment for Hydro Jetting, Video Inspection, Leak Detection, Rooter & drain clearing in the market today. 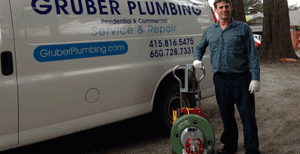 See why The Bay area chooses Gruber Plumbing. $25.00 off for rooter & drain cleaning in the San Francisco Bay area. See our plumbing Discounts Page. Contact us for a free quote on rooter services @ 415-816-5475.